The creation of Walt Disney World’s EPCOT Center was the work of many talented artists and designers, most less widely-known than the few whom Disney publicly used to represent the project over the years. 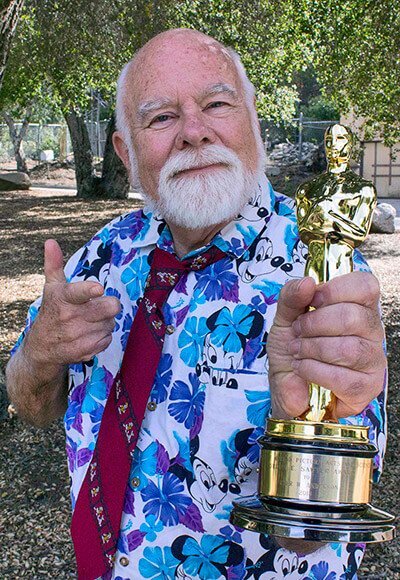 Anderson was a cinematographer, visual effects supervisor and 3D film expert – and many of those contributions came in attractions at Disney theme parks, Universal Studios and more. “It makes me proud of all I have accomplished,” said Peter. I met Peter, now 71, in 1981 at the Walt Disney Studios, where I eventually became the post-production supervisor for the EPCOT Center film efforts for its October 1982 opening. A lot of the technical leadership for those films was going to come from Disney’s special photo effects team in the department known as the Process Lab. Located at the north end of the building complex that housed Ink and Paint was Animation Camera and Cutting, headed up by Art Cruikshank. But as EPCOT’s film efforts were getting underway, Art came down with some serious health problems. So Disney’s management reached out and made an agreement with Universal Studios to loan them Peter, who had been working on “Battlestar Galactica” and other effects-oriented television and film projects. Peter ended up helping design the camera rigs used in the filming of “Magic Journeys,” which became a standard in live action 3D cinematography. He also helped with the design of the unique 3 70mm-camera rig used in filming the live action for the Universe of Energy. In fact, Peter’s hand was involved in nearly every film at EPCOT Center on opening day as the entire project was pushing the film envelope throughout the park. In American Adventure, the 70mm film is sometimes the backdrop for the stage show, and at other times it is the main part of the show. But it is projected in a way that had never been done before, on a huge rear-projected screen. The challenges included calculating the math for a specially made lens that would provide an even lighting field across the wide, nearly 80-feet expanse. Meanwhile on “Magic Journeys,” it meant combining a wide variety of live action shots to make the child, whose journey the story is centered around, look like he’s a giant behind a circus ring full of clowns; or helping to create ground-breaking computer animated scenes of an large human eye, or lightning extending from a witch’s hands. “We had all kinds of people doing amazing things for EPCOT,” he said. After EPCOT opened, Peter worked on several other Disney projects including “American Journeys,” “Captain EO,” “Muppet*Vision 3D” and more. Recently, Peter worked on the King Kong 360 3D experience at Universal Studios Hollywood in California. He worked out the layout that ended up using 16 digital projectors that run at 60 frames per second, projecting 3D visuals onto two 285-foot long screens to make it seem to tram riders that they are in the middle of the action as King Kong and a dinosaur do battle. But of all those projects, Peter said he enjoyed working on the 3D film “Magic Journeys” the best. “At that time no one thought we could make that film and we ended up doing it,” he said. And for all of his efforts, in theme parks and beyond, he’s now proudly an honorary Academy Award holder. Throughout the entire 80’s up until the 00’s renaissance, I remember the kite in Magic Journeys and Kermit on the fire ladder in MV3D as two of the only 3D effects I’d seen in a theater that ever WORKED. With all the mania for conversion, let’s remember the days when it was made in the camera. Congratulations!! Magic Journeys was a “must do” when at WDW. Miss it. Thanks for making it so memorable. Now, if I could get my hands on a DVD non-flickering copy of Magic Journeys I would be in heaven. This guy shaped my youth like no other! Thanks, Peter!